In South Africa, the Department of Home Affairs (DHA) - the department charged with managing migration - has struggled to control growing migration flows, particularly the increased demand on the asylum system. The DHA has both relied on and sought to undermine documentation attempts as part of its migration management efforts. These shifting practices reveal an official ambivalence toward granting foreign migrants documents and the rights that accompany them. Ensuring that foreign migrants remain undocumented fulfils the DHA's objective of facilitating their removal, but it undercuts the administration's ability to know who is in the country, another expressed DHA goal. Examining two documentation schemes - the asylum system, and the three-month documentation programme targeting undocumented Zimbabweans - this article highlights these conflicting purposes. It explores the DHA's administrative strategies and practices to withhold or deny documentation, and hence legal rights, to foreign migrants even when its stated goal is documentation. Looking at the role that documentation plays in state administration, the article argues that the street-level organisational approach and its focus on implementation best captures the actions of the DHA, underscoring the ways in which street-level bureaucrats can influence documentation policy and practice by determining who gets access to documents. South Africa's post-apartheid immigration regime confers a range of legal rights on documented migrants. But the shifting practices of the Department of Home Affairs (DHA) - the bureaucracy charged with managing migration - indicate an official reluctance to bestow these rights through documentation. Instead, the DHA has increased the barriers or denied documentation to many foreign migrants. Ensuring that these migrants remain undocumented fulfils the DHA objective of facilitating their removal, but it also undercuts the administration's ability to know who is in the country, another expressed DHA goal. This article highlights these conflicting purposes, identifying many of the DHA's administrative strategies and practices to withhold or deny documentation, and hence legal rights, to foreign migrants even when its stated goal is documentation. These practices also underscore the ways in which street-level bureaucrats can influence documentation policy and practice by determining who gets access to documentation. The DHA has struggled to control increasing levels of migration since 1994. Significant numbers of migrants find their way into the country's asylum system, which gives them an opportunity to regulate their status at least temporarily. This situation has given rise to a somewhat equivocal approach towards documentation. While the DHA has introduced measures to document greater numbers of migrants, it has simultaneously undermined these measures in the belief that most lower-skilled migrants are not in the country legitimately, particularly those entering the asylum system. The DHA has actively worked to limit documentation, employing a variety of administrative procedures to make it exceedingly difficult for migrants to obtain documentation or to acquire refugee status. Even the Zimbabwe Documentation Project (ZDP), the scheme targeting undocumented Zimbabweans, was accompanied by significant administrative barriers. The DHA's contradictory policy goals and actions on both the documentation of asylum seekers and the ZDP are emblematic of its approach toward migration more generally. For skilled migrants, Stephen Ellis and Aurelia Segatti find that, while the government has recognised the severe shortage of skilled labour and has expressed concern at the scale of the African 'brain drain', the DHA continues to impose severe limits on the number of work permits issued for foreign skilled migrants and to not process permit applications in a timely fashion.1 Ellis and Segatti conclude that 'despite official rhetoric, government circles hold broadly negative views regarding the role of migration in skills development in South Africa. '2 That is, the government prefers not to use foreign skilled migrants to fill the labour shortage in the country. During apartheid, immigration was limited almost exclusively to white migrants, with the exception of migrant labourers from neighbouring African countries.3 Jonathan Crush and Raesibe Mojapelo describe the country's 'carefully managed migration policy' during this period, which was 'designed to utilize cheap labour from outside the country and dump it back over the borders when it was no longer wanted. '4 Accordingly, the Aliens Control Act of 1991 applied largely to white migrants, while black migrants arrived in the country through bilateral labour agreements.5 There was no refugee policy during this time, although thousands of Mozambicans who fled the civil war were allowed to live without formal legal status in the 'homeland' areas. In contrast to this carefully managed migration system during apartheid, early post-apartheid immigration policy (1994 to 1998) was described as 'confused, incoherent, reactive, defensive, and lacking in vision. '6 We emphasise the DHA's contradictory and conflicting goals in its management of the asylum system and the ZDP, thus demonstrating continuity in key characteristics in migration policy between the early and more recent post-apartheid years. Following the transition to democracy, the government entered into a 1997 Memorandum of Understanding between the South African Development Community (SADC) and the United Nations High Commissioner for Refugees (UNHCR) that reflected a more open approach to migrants and refugees. The government then began drafting laws in line with its new rights-based constitution, including the 1998 Refugees Act and the 2002 Immigration Act. The Refugees Act was largely based on the humanitarian principles of the international refugee convention, while also recognising the large-scale instabilities giving rise to flight in the African region. The Immigration Act replaced the far more restrictive Aliens Control Act but offered few options for economic migrants in the African region. Although in line with the country's constitutional ideals, the country's asylum and immigration laws stand apart from public sentiment. As migration to South Africa has grown, foreigners have increasingly been blamed for the country's socioeconomic ills, including high crime and unemployment rates. Much of this animosity has specifically targeted lower-skilled African migrants, seen to be competing with locals for employment and public services. In this context, increasingly restrictive migration and documentation policies play well with the population. Government sentiment has shifted accordingly since the early days of democra-tisation. A 2012 ANC policy document attributed many of the current immigration challenges to the country's unconditional adoption of regional and international instruments, which had failed to take into account the migration realities confronting the state and to recognise migration as a strategic security issue during the democratic transition.8 Noting that 95 per cent of asylum seekers are in fact economic migrants threatening the country's wellbeing, the document proposed a 'risk-based approach' that involved detaining 'high risk' asylum seekers9 and establishing a monitoring system. It also advocated refusing asylum to those individuals who had transited other countries en route to South Africa. The increasingly restrictive migration policy has existed alongside efforts to manage migration by expanding documentation. In 2008, the DHA began taking steps to make the asylum system more efficient, including the implementation of same day adjudication to move people through the system more quickly. To further ease demand on the system, the department introduced a temporary permitting scheme for Zimbabweans in 2010. The effectiveness of both the asylum and Zimbabwean documentation efforts, however, were compromised by the department's view that most lower-skilled migrants were not in the country legitimately. The conflicting goals around these documentation schemes are explored below. Existing theoretical approaches on the role of documentation as a tool of the state have shed some light on the South African example, though they cannot fully account for the processes at work. James Scott, for example, characterises documentation as an index of a modern state and the product of the capacity of the administration to measure or obtain with some accuracy the objects of its interest.10 Some historians have presented an alternative view, drawing attention to how state administrations may deliberately not document social groups because they do not wish to empower those groups vis-a-vis the administrative state.11 We briefly discuss these perspectives on the function that documentation plays in state administration, indicating their strengths and limitations for understanding the South African case. We suggest that the street-level organisational approach to public policy and politics might better capture the actions of the South African bureaucracy that administers foreign migration. Scott's description of the simplification of society is relevant. In terms of South African refugee and immigration laws, the DHA bureaucracy is responsible for classifying and documenting foreign migrants as either asylum seekers (or other categories of legal migrants) or as illegal foreigners. Asylum status entitles migrants to remain in the country, to work, and to access some social services (health, education and so forth) while awaiting their refugee status determination. Illegal foreigner status leads to detention and deportation. In an effort to manage the high numbers of asylum seekers, DHA bureaucrats have classified most foreign migrants who seek asylum as economic migrants and thus not entitled to asylum,16 which renders them illegal and subject to deportation. In order to simplify reality, the bureaucracy has ignored mixed migration motives that may give rise to asylum claims and labelled all those individuals with mixed motives as economic migrants.17 As described above, this transforms social reality to serve a key DHA objective: to limit the numbers of documented migrants in the country. However, the DHA has also introduced occasional schemes explicitly designed to document foreign migrants in the country, in part to know their numbers. The DHA's decision to deny documentation to the vast majority of foreign migrants through the asylum system, while at the same time introducing schemes to document foreign migrants, suggests an ambivalent approach toward documentation and knowledge on the one hand, and the benefits that accompany it on the other. Scott's simplified classification schemes fail to capture such ambiguity in what bureaucracies may seek to know and choose to ignore. For Scott, the modern state's administrative capacity and effectiveness are inextricably connected and premised on 'reliable means of enumerating and locating its population'.18 In South Africa, the DHA lacks reliable numbers on foreign migrants -in part because of its documentation practices - and the effectiveness of the deportation policy growing out of these documentation practices is, at best, ambiguous. But Scott's link between administrative knowledge, capacity, and state effectiveness does not consider that administrative strategies and practices may undermine state effectiveness. DHA administrative strategies and practices that have delayed or denied the documentation of foreign migrants have had significant effects on the state's efforts to know and control migrants. Indeed, documentation would empower citizens and, in our case, eligible non-citizens as the law intends, enabling them to remain legally in the country and to access other legal benefits. However, Breckenridge and Szreter's portrayal of bureaucracies that choose ignorance in some circumstances does not capture a bureaucracy that seeks both to know and not to know. In our case, the DHA has expressed ambiguity towards documentation because the efforts to acquire state knowledge of the foreign population confer benefits on this population. Accordingly, it is not possible to assess whether there is a link, as Breckenridge and Szreter suggest, between the bureaucracy's deliberate will not to know, on the one hand, and its authority and power, on the other. Scott and Breckenridge and Szreter share a common focus on bureaucratic intentions - whether a will to know (Scott) or a choice to not know (Breckenridge and Szreter). These authors also link bureaucratic intent relating to knowledge (or lack thereof) and capacity to obtain the knowledge with state effectiveness (Scott) and state power and authority (Breckenridge and Szreter). Importantly, the street-level approaches do not assume that administrative exclusion - the denial of benefits to those who are eligible - is necessarily the product of intentions, although they do leave open that possibility.24 Instead, they highlight how administrative exclusion often occurs as a result of the practices, intentional or not, employed by those who must interpret and apply eligibility criteria as they adjudicate claims for benefits. Our analysis adopts the street-level organisational approach's focus on administrative practices and their effects, but we also discuss DHA policy intentions where they have been explicit. Our discussion of the documentation project for Zimbabweans shows that, even where intent is explicit, administrative practices may work against achieving stated objectives. In line with the street-level approaches, the discussion below demonstrates how administrative practices relating to documentation are used to deny asylum seekers and other categories of migrants a legal basis to remain in the country, operating as a form of administrative exclusion. Administrative exclusion advances the broad interests of the bureaucracy in deporting as many individuals as possible. However, the barriers to documentation are creating large numbers of undocumented migrants in the country, while forcing migrants to turn to illegal means to obtain documentation, often through the very officials working in the street-level bureaucracy. In response to the challenge of a large undocumented foreign population, the state has at times introduced temporary documentation schemes. But here too, the state interest in limiting the numbers of migrants it regularises has undermined the effective functioning of these documentation schemes. The following sections examine how the conflicting goals - limiting the number of legal migrants while also keeping track of who is in the country - affect the functioning of the bureaucracy tasked with administering documentation. These sections focus on two particular documentation schemes: the asylum system, where the overriding goal is exclusion; and the temporary effort to document Zimbabweans, ostensibly introduced to improve knowledge and tracking of the Zimbabweans in the country. From 2006 to 2011, South Africa received the highest number of asylum seekers of any country in the world.25 Although these numbers have steadily declined since their peak in 2009, the DHA continues to view the asylum system as subject to abuse and exploitation by economic migrants.26 The broad appeal of the asylum system stems in part from the lengthy application process. The law entitles any individual to apply for asylum without qualification. Only a refugee status determination officer may subsequently determine that an individual does not qualify for refugee status, and the individual may appeal this decision. The individual remains an asylum seeker until he or she has exhausted all final reviews and appeals, and is entitled to documentation during this period, which can last for several years. The asylum seeker permit confers the right to reside and work in the country; it is often the only regularisation option open to economic migrants seeking work opportunities. To tackle the perceived exploitation of the asylum system by economic migrants, the department has sought to block access to documentation while also minimising the associated benefits. This situation was alleviated after the DHA opened two additional offices in 2010 - a second office in Pretoria (the Tshwane Interim Refugee Reception Office, or TIRRO), and an office at the border town of Musina. Because of the efforts to deny entry, large numbers of migrants cross the border informally. Many are later arrested while making their way to a refugee reception office (RRO), particularly those who bypass the border RRO in Musina to apply in an urban area. In contravention of legal guarantees, the DHA has barred individuals who are arrested before they reach an RRO from obtaining documentation as asylum seekers, despite their stated intention to apply. Like their counterparts at the border, they too are sent to Lindela as illegal foreigners. The DHA has adopted other ad hoc measures to limit access to the RROs. For a period beginning in 2011, some RROs did not let individuals apply for asylum if they were not in possession of an asylum transit permit obtained at the border.31 The department has further maintained that it has no obligation to assist an individual deemed to be an illegal foreigner to apply for asylum at either a port of entry or at an RRO,32 suggesting that such assistance is discretionary rather than required by law and ensuring that individuals are classified as illegal foreigners before they have an opportunity to apply for asylum.33 Although this strategy serves the government's direct interest in deporting irregular migrants, its long-term effectiveness is less clear, as many deportees later return to South Africa.34 Lacking access to documentation, these individuals remain outside government control and are much harder to track. Even those individuals who do manage to obtain documentation as asylum seekers may subsequently have this documentation revoked in an effort to remove them from the system. The department has erected various barriers to prevent individuals from maintaining their status as asylum seekers. Key among these is the difficulty in renewing expired permits. Individuals may fail to renew their permits before they expire for a variety of reasons. These include inability to access the office because of long queues, inability to take time off work, permit expiration on a day that the office was closed, illness, insufficient funds for transport to a distant office, inability to find child care, or other personal reasons.35 When these individuals do arrive at the office, the DHA requires that they pay a fine in order to renew their permits. Fine amounts vary, but are often prohibitively expensive, making it impossible for an individual to renew his or her permit. Individuals who lose their permits (or have them stolen) face similar difficulties and may be unable to pay the fine. The department has both actively obstructed the documentation process and has allowed procedural irregularities to go unchecked as it seeks to limit the availability of asylum seeker permits. It has done so out of a belief that economic migrants are exploiting the benefits that accompany documentation as an asylum seeker. But just what advantages does documentation confer, and to what extent are these benefits realised? The next section examines the value of documentation in practice, and whether the benefits the DHA believes are being exploited are real or illusory. The asylum seeker document entitles the holder to a variety of benefits. Most importantly, it entitles the holder 'to sojourn' legally in the country until a final decision has been reached on their asylum claim. The individual retains this right until he or she has exhausted all final reviews and appeals of any decisions with the standing committee, the Refugee Appeal Board, the courts, or the minister. The right to reside legally in the country comes with a variety of accompanying entitlements. Asylum seekers are entitled to work and study, to access health care, to open bank accounts, and to reside in their communities free from the threat of arrest or detention. While these rights exist in law, they are often more elusive in practice, diminishing the value of the asylum seeker permit. Police, banks, health care providers, schools, and other institutions often refuse to recognise the validity of these documents. Asylum seekers have gone to court to preserve their access to banking, employment, and education. Nonetheless, potential employers often refuse to hire individuals with asylum permits because they are unfamiliar with the law. Banks have also deemed asylum documents insufficient to establish or maintain access to bank accounts.39 Asylum seekers and other foreign migrants have become targets of crime because these banking difficulties result in their carrying large amounts of cash. And asylum seekers have struggled to enrol their children in schools, as some principals have refused to recognise the validity of their documents. Many asylum seekers also report being turned away from public clinics and hospitals. Thus, individuals who manage to overcome the obstacles around obtaining documentation may nonetheless be unable to realise documentation's full benefits because of the efforts of both government and private actors. This situation is indicative of the department's somewhat contradictory approach to documentation. Although documentation provides a mechanism to manage migration, it also creates the unwanted situation of legitimising migrants perceived to be in the country illegitimately. As a result, the department has sought to minimise access to documents and has impeded the maintenance of documented status. At the same time, it has found ways to limit the benefits conferred by documentation to target those perceived to be exploiting the system. This incongruous approach to documentation is perhaps most visible in the example of the Zimbabwe Documentation Process (ZDP) - a special documentation process introduced to regularise the status of the country's largest migrant population. Although presented as a mechanism to identify who was in the country, the DHA also created barriers that made it difficult for eligible Zimbabweans to obtain documentation under this programme. These cross-purposes reflect the conflicting views toward documentation: on the one hand, as a mechanism of control, and on the other, as a device conferring benefits that the state would prefer not to provide. The next section examines the ZDP. Zimbabweans make up the largest proportion of asylum seekers in South Africa (see Figure 1). Very few of them, however, receive recognition as refugees.46 In 2011, 51,031 Zimbabweans applied for asylum; 83 were granted refugee status.47 The government has categorically labelled Zimbabweans as economic migrants regardless of the reasons giving rise to their flight. Despite their lack of success in obtaining recognition through the asylum system, Zimbabweans continue to enter this system in large numbers. Between April 2008 and March 2009, roughly half of asylum applications were from Zimbabweans. The following year (April 2009-March 2010), two-thirds were Zimbabwean. An unknown number of Zimbabweans in South Africa are undocumented. The deputy Home Affairs minister explained that the new policy was partly designed to separate economic migrants from genuine asylum seekers.52 The problems around implementation, however, meant that many individuals who applied for the ZDP eventually made their way back to the asylum system. On a more calculated level, the programme served to justify the resumption of deportations. When the ZDP was introduced in September 2010, a moratorium on deportations to Zimbabwe had been in effect since April 2009, together with a 90-day visa-free entry system for Zimbabweans. This set of conditions, described as a special dispensation, was the result of an April 2009 meeting between the Zimbabwean and South African Home Affairs ministers. At this meeting, the ministers discussed a special dispensation permit under section 31(2)(b) of the Immigration Act, but this permit never came to fruition. Seeking to end the special dispensation conditions, the ZDP provided a pathway for regularisation before resuming deportations. The purpose of documentation under the ZDP remains unclear in light of these conflicting statements. The implementation process further calls into question its intended purpose. Despite the department's characterisation of the ZDP as a way to establish who was in the country, its methods of implementation undermined this goal. The minister called the process a 'mopping up exercise' for those who did not register during the special dispensation, referring to individuals who 'missed the deadline' of that dispensation.55 But individuals never had an opportunity to register under the dispensation because the special permit was never implemented. The ZDP, then, marked the first opportunity for most Zimbabweans to regularise their status outside the asylum system. If the department's main goal was to document as many Zimbabweans as possible, implementation of the programme would have been better served by acknowledging the first-time nature of this opportunity, rather than treating it as an extension of the previous dispensation for those few remaining Zimbabweans who had missed the so-called previous opportunity. The implementation of the ZDP suggests limited DHA support for the regularisation scheme. Rather than create a programme that allowed for the documentation of as many Zimbabweans as possible, the department seemed intent on minimising the reach of the programme prior to the resumption of deportations. At the same time, once the ZDP was under way, the department began taking incremental steps to expand its reach. While this may reflect poor planning, it also may serve as an indication of the department's conflicted approach to documentation. The DHA announced the ZDP shortly after the cabinet terminated the special dispensation on 2 September 2010. It was implemented hastily less than three weeks later on 20 September. The short lead-up time left many offices unprepared for the process, and many migrants and their employers uninformed about the requirements and possible implications. These problems were exacerbated by the short timeline allocated to the process, which lasted just over three months and terminated on 31 December 2010. The department gave no explanation for the short time period, except to state that it believed that this period was sufficient to document all eligible Zimbabweans in the country.56 But, given the lack of accurate estimates of the number of Zimbabweans in the country, and the fact that the department had previously relied on highly inflated estimates, the three-month period cannot be linked to any rational calculation of the time needed to reach all eligible Zimbabweans. The department also initially limited registration to those individuals who had been in the country prior to 31 May 2010, shortly after the originally scheduled April 2010 end date of the special dispensation. Although the department did not explain the May cutoff, it had the effect of excluding otherwise eligible Zimbabweans in the country. If the goal was to document previously undocumented migrants as a mechanism of control, the cutoff date lacked a rational basis. Assuming the goal was to deter future migration, it is unclear why the cutoff date made ineligible the individuals who were already in the country before the ZDP was announced. The decision is consistent with a desire to deport rather than document many of the Zimbabweans in South Africa. The short preparation and implementation periods resulted in a host of problems that limited the effectiveness of the ZDP in documenting Zimbabweans.60 As mentioned, many offices were unprepared and unfamiliar with the requirements, resulting in inconsistent application procedures across offices. The short application period also resulted in long queues, while offices battled high demand with insufficient staff and resources. Many individuals also struggled to obtain the necessary documents before the deadline, particularly Zimbabwean passports. As a result, the documentation process was largely biased in favour of those who had previously possessed passports. In response to criticism that Zimbabweans were scrambling to get passports, and in contrast to the statements above indicating that the DHA did not know the numbers of undocumented migrants in the country, the chief of immigration services stated: 'Most Zimbabweans come into the country legally. The statistics and the facts from our movement control system at Beit Bridge (border post) show that. And our system shows that they have passports. '61 Again, this representation differed from past presentations of reality that pointed to the high numbers of undocumented migrants. In fact, these high numbers were cited as part of the motivation behind the ZDP, a motivation that then evolved to better fit with the reality of implementation. The application process itself was highly inefficient, as individuals had to queue on three separate occasions simply to submit an application, creating further barriers. The hasty implementation also left many employers wary of the process. As a result, some Zimbabweans reported that their employers were unwilling to provide the necessary affidavits out of concern over the legal implications of acknowledging employing an undocumented migrant.62 Either deliberately or inadvertently, the DHA failed to communicate effectively with employers about the ZDP. All of these obstacles greatly limited the reach and potential effectiveness of the ZDP as a documentation mechanism. But the DHA also took steps to alleviate some of these obstacles after the application process began. At some point during the process, the DHA dropped the 31 May cutoff and allowed all Zimbabweans to apply, although it never officially announced this change in policy. The department also relaxed the passport and fingerprinting requirements during the last two weeks, allowing individuals to apply with a receipt showing they had applied for a passport. During the last few days, it allowed individuals with any proof of Zimbabwean nationality to apply. These changes appeared to be well-intentioned responses to criticisms levelled during the application process. But it is unclear what effect they had, as many individuals may have given up on the ZDP in frustration and remained unaware of these changes, particularly if they had returned to Zimbabwe for the holidays. Many Zimbabweans expressed confusion over the changing requirements. The bureaucratic inefficiencies also delayed the start of deportations, slated to resume at the beginning of 2011. The 10-day turnaround time initially projected for applications ultimately stretched well into the following year, and deportations only resumed in October 2011. But such measures of success depend on the true goals of the project. A large number of Zimbabweans remained undocumented, and the department itself acknowledged that it did not know how many did not apply,65 either by choice, ineligi-bility, or because of problems in the application process. In touting the success of the project, the director-general refused to consider reopening applications in response to a request from Zimbabwe's Home Affairs co-minister, insisting: 'We have said it is closed forever. If there are those who did not take up that offer, they are now here illegally. '66 This approach is consistent with a policy whose true goal was not documentation for its own purposes, but rather documentation as a way to reassert illegality and resume deportations of large numbers of Zimbabweans. As a documentation effort, the ZDP sends a mixed message regarding the desirability of documentation. While the DHA touted the ZDP as a mechanism for tracking who was in the country, the manner of implementation did not support this goal. DHA practice alternated between restricting access to the regularisation scheme and taking steps to reduce these barriers. In the end, the small scope and limited duration of the ZDP suggests that it was less about expanding regularisation options than about providing some sort of justification for resuming deportations. 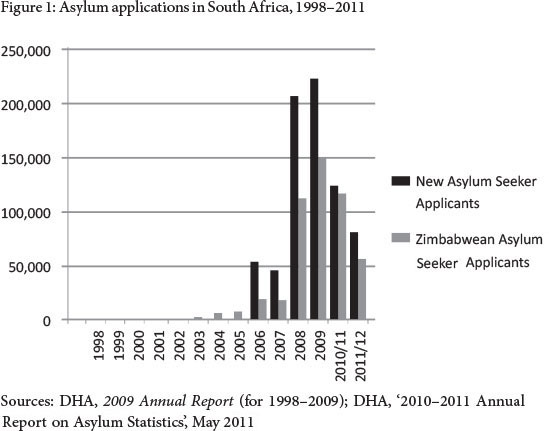 The DHA's use of documentation in South Africa's asylum system and the ZDP (September-December 2010) illustrates the contradictory approach to documentation and the administration's conflicting goals: to maintain a record of who is in the country and to limit foreign migrants' access to documentation because of the rights that come with it. These competing state intentions around documentation limit the bureaucracy's effectiveness and control, either in relation to obtaining knowledge or in choosing to ignore elements of social reality to achieve certain objectives. This stands in contrast to documentation literature that portrays bureaucracies as making unambiguous choices to either seek or not seek knowledge. Much of this literature also gives insufficient attention to bureaucratic practices affecting documentation and their potentially powerful political and policy effects. Adopting the street-level organisational approach to analyse bureaucratic practices around documentation in the asylum system and the ZDP highlights how these practices create new policies that deny rights to the selected population while also undermining state goals around knowledge of who is in the country, resulting in greater numbers of undocumented migrants that remain removed from state record keeping. But while this makes them less visible to the government, they remain visible to society, where their undocumented status may have profound social, economic and political effects in the labour market, in crime dynamics and in social cohesion. These unintended consequences demand further exploration in theoretical approaches examining the relationship between documentation on the one hand and state authority and effectiveness on the other. 3 J. Handmaker, Advocating for Accountability: Civic-State Interactions to Protect Refugees in South Africa (Antwerp: Intersentia, 2009); [ Links ] J. S. Crush and D. A. McDonald, 'Introduction', Africa Today, Special Issue: 'Evaluating South African Immigration Policy after Apartheid', 48, 3, 2001, 1-13. 4 J. Crush and R. Mojapelo, 'Introduction: Immigration, Human Rights and the Constitution,' in J. Crush (ed.) Beyond Control: Immigration and Human Rights in a Democratic South Africa (in press), 18, http://www.queensu.ca/samp/publications/book/intro.htm (accessed 16 March 2014). 5 Ibid. For the most part, the Aliens Control Act merely consolidated existing legislation from the earlier apartheid era. 7 The figures are taken from DHA's annual summaries of asylum statistics. 8 African National Congress, 'Peace and Stability: Policy Discussion Document', 2012, available at http://www.anc.org.za/docs/discus/2012/peacev.pdf. 9 The policy document does not define what constitutes a high-risk asylum seeker. 12 Scott, Seeing Like a State, 11, 80. 16 In 2011, the director-general characterised the majority of asylum seekers as 'economic migrants using a back door.' IRIN (Integrated Regional Information Networks), 'South Africa: "harsher regime" for asylum seekers' 29 November 2011, available at http://www.irinnews.org/report/94337/south-africa-harsher-regime-for-asylum-seekers. 17 See R. Amit, 'All Roads Lead to Rejection: Persistent Bias and Incapacity in South African Refugee Status Determination,' ACMS [African Centre for Migration & Society] Research Report, 2012 and R. Amit, 'No Way In: Barriers to Access, Service and Administrative Justice at South Africa's Refugee Reception Offices', ACMS Research Report, 2012. 18 Scott, Seeing Like a State, 77-8. 19 Breckenridge and Szreter, 'Introduction', 6. 22 See E. Z. Brodkin and G. Marston (eds), Work and the Welfare State: Street-Level Organizations and Workfare Politics (Washington, DC: Georgetown University Press, 2013). 23 E. Z. Brodkin and M. Majmundar, 'Administrative Exclusion: Organizations and the Hidden Costs of Welfare Claiming', Journal of Public Administration Research and Theory, 15, January 2010, 2. 25 UNHCR, 'Global Trends 2012', 19 June 2013, available at http://www.unhcr.org/51bacb0f9.html. Preliminary numbers for 2012 indicate that numbers have dropped significantly, moving South Africa to third place. 26 In a May 2013 parliamentary briefing, the deputy director-general pointed to abuse by economic migrants in the asylum system as one of the main problems in immigration management. Parliamentary Monitoring Group, 'Deputy Minister and Department of Home Affairs Briefing on Strategic and Annual Performance Plans', 14 May 2013, available at http://www.pmg.org.za/report/20130514-deputy-minister-department-home-affairs-briefing-strategic-and-annual-perfomance-plans-2013. 27 These access problems are recorded in R. Amit, 'National Survey of the Refugee Reception and Status Determination System in South Africa', ACMS Research Report, 2009. 28 M. S. Gallagher, 'Refugee Status Determination in Southern Africa', Forced Migration Review, 32, April 2010, 55; DHA, '20102011 Annual Report on Asylum Statistics', May 2011. 29 Amit, 'No Way In'. 30 Lawyers for Human Rights (LHR), 'Monitoring Immigration Detention in South Africa', 2008, 2010, available at http://www.lhr.org.za/sites/lhr.org.za/files/LHR_2010_Detention_Report.pdf, http://www.lhr.org.za/sites/lhr.org.za/files/LHR%20detention%20monitoring%20report%2010%20Dec%2008.pdf. R. Amit, 'Lost in the Vortex: Irregularities in the Detention and Deportation of Non-Nationals in South Africa.' Forced Migration Studies Programme Research Report, 2010, available at http://www.migration.org.za/sites/default/files/reports/2010/Lost_in_the_Vortex-_Irregularities_in_the_Detention_and_Deportation_of_Non-Nationals_in_South_Africa_0.pdf. R. Amit, 'Breaking the Law, Breaking the Bank: The Cost of Home Affairs' Illegal Detention Practices,' ACMS Research Report, 2012, available at http://www.migration.org.za/sites/default/files/publications/2012/breaking_the_law_breaking_the_bank_full_report.pdf. 31 Ssemakula v. the Minister of Home Affairs (2012). WCHC (Western Cape High Court), Case 4139/11. 32 LS v Minister of Home Affairs, SGHC (South Gauteng High Court), Unreported Case 49231/10 (10 December 2010), Answering Affidavit, para 26. 33 The Supreme Court of Appeal (SCA) has stated that DHA officials are obliged to provide intended applicants with "every reasonable opportunity" to apply. Abdi v Minister of Home Affairs 2011 (3) SA 37 (SCA) (15 February 2011), para 22. 34 The minister ofHome Affairs acknowledged this problem following a visit to the country's main detention centre for illegal foreigners, adding that the country was spending 70-90 million rand annually on its failed deportation policy. South African Broadcasting Corporation, 'Up to R90 million spent on deporting illegal immigrants: Pandor', 25 January 2013, available at http://www.sabc.co.za/news/a/5f9bcb004e4fae738bdabff251b4e4e2/Up-to-R90-millionspent-on-deporting-illegal-immigrants:-Pandor-20130125. 36 Information received from Tal Schreier, attorney at the University of Cape Town Refugee Rights Clinic. This clinic has brought a legal challenge against the refusal to renew asylum permits. 38 Phone conversation between candidate attorney at LHR and the acting chief director, Refugee Affairs, 17 August 2010. 40 See, for example, LHRpress release, 'Legal Challenge on Refugees' Rightto Workand Operate Businesses,' 2 December 2013, available at http://www.lhr.org.za/news/2013/press-release-legal-challenge-refugees%E2%80%99-right-work-and-operate-businesses;IRIN, 'South Africa: Police target foreign traders in Limpopo,' 17 August 2012, available at http://www.irinnews.org/report/96130/south-africa-police-target-foreign-traders-in-limpopo. 41 V. Gastrow and R. Amit, 'Elusive Justice: Somali Traders' Access to Formal and Informal Justice Mechanisms in the Western Cape', ACMS Research Report, 2012. 42 Statements by DHA officials at a meeting of the Johannesburg Migration Advisory Committee, Johannesburg Theatre Penthouse, 11 September 2012. A resolution affirming that the rights of asylum seekers, refugees, and documented migrants to work included the right to establish businesses was presented at this meeting and defeated. 43 See Amit, 'Breaking the Law, Breaking the Bank' and LHR, 'Monitoring Immigration Detention in South Africa'. 44 Some of these cases are recounted in Amit, 'Breaking the Law, Breaking the Bank'. 45 JAA v Minister of Home Affairs (2009), SGHC, Unreported Case 9167/09, 3 March 2009. 46 UNHCR reported that in 2011, Zimbabwean asylum seekers in South Africa had a success rate of 0.5. UNHCR, Statistical Yearbook 2011, avalable at http://www.unhcr.org/516282cf5.html. 47 DHA, 'Annual Report on Asylum Statistics', 2011. 48 News 24, 'Home Affairs to clear permit backlog' 18 November 2010, available at http://www.news24.com/SouthAfrica/Politics/Home-affairs-to-clear-permit-backlog-20101118. D. Taylor, 'Zimbabweans in South Africa Suffer under New Immigration Rules,' Voice of America, 4 November 2010, available at http://www.voanews.com/content/zimbabweans-in-south-africa-suffer-under-new-immigration-rules--106777198/160291.html. 49 J. Mamabolo, 'Briefing to the Media by the Head of the Zimbabwe Documentation Process,' 30 June 2011, available at http://www.politicsweb.co.za/politicsweb/view/politicsweb/en/page71656?oid=243714&sn=Detail&pid=71656. 50 At the time of writing, the DHA had begun making statements suggesting the possible introduction of a work visa for economic migrants from SADC countries. 51 'Minister Dlamini Zuma on end of special dispensation for Zimbabwean citizens, Gallagher Estate, Midrand, Johannesburg', 3 September 2010, available at http://www.info.gov.za/speech/DynamicAction?pageid=461&sid=12720&tid=17235. 52 D. Taylor, 'Monitors Highlight "Gaps" in New South African Immigration Policy', Voice of America, 5 November 2010, available at http://www.voanews.com/content/monitors-highlight-gaps-in-new-south-african-immigration-policy--106777833/160293.html. 54 'Minister Dlamini Zuma on end of special dispensation for Zimbabwean citizens, Gallagher Estate, Midrand, Johannesburg', 3 September 2010, available at http://www.politicsweb.co.za/politicsweb/view/politicsweb/en/page71656?oid=197248&sn=Detail. 55 Interaction with media by Home Affairs Minister N. Dlamini Zuma regarding documentation of Zimbabweans, Home Affairs Office, Harrison Street, Johannesburg, 20 December 2010, available at http://www.info.gov.za/speech/DynamicAction?pageid=461&sid=15359&tid=26010. 56 N. Tay, 'Zimbabwe Permit Deadline Stays', Business Day, 7 October 2010, available at http://www.bdlive.co.za/articles/2010/10/07/zimbabwe-permit-deadline-stays. 57 Minister N. Dlamini Zuma on end of special dispensation for Zimbabwean citizens, 3 September 2010. 58 ZDP: briefing by DHA, 19 September 2011. 59 'Home Affairs to Clear Permit Backlog', News24, 18 November 2010, available at http://www.news24.com/SouthAfrica/Politics/Home-affairs-to-clear-permit-backlog-20101118. 60 These problems are detailed in R. Amit, 'The Zimbabwe Documentation Process: Lessons Learned', ACMS Research Report, 2011. 61 D. Taylor, 'Passport Panic for Zimbabwean Migrants in South Africa', Voice of America, 5 November 2010, available at http://www.voanews.com/content/passport-panic-for-zimbabwean-migrants-in-south-africa---106778418/156755.html. 62 Amit, 'Zimbabwe Documentation Process: Lessons Learned'. 63 Zimbabwean Documentation Process: Briefing by Department of Home Affairs, 19 September 2011. 66 'Zim documentation almost done', News24, 19 January 2012, available at http://www.news24.com/SouthAfrica/Politics/Zim-documentation-almost-done-20120119. 68 Numbers based on DHA's submitted response to the Parliamentary Home Affairs Portfolio Committee, on file with the author. They differ from the numbers reported in the department's 'Annual Report on Asylum Statistics', 2010/2011. 69 Amit, 'Zimbabwean Documentation Process: Lessons Learned'.